Former Prince Albert Winter Festival board member Wes Stubbs (left) and current festival board chair Barry Mihilewicz (right) pose for a photo at the Alfred Jenkins Field House on Thursday. Stubbs was named the honourary chair for the 2017 festival. © Herald photo by Jason Kerr. 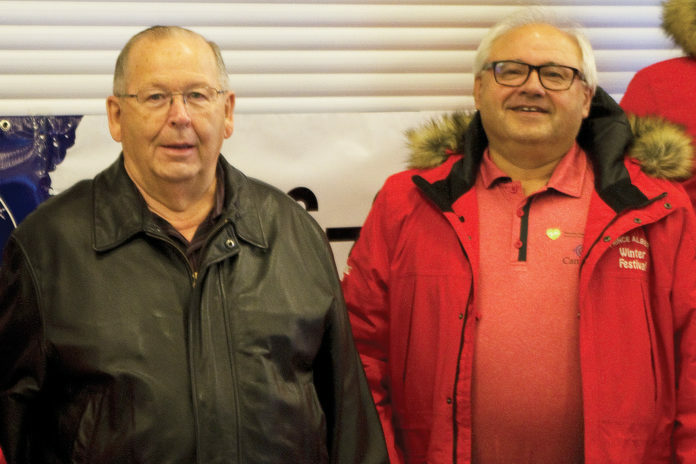 More than 30 years after his last year with the Prince Albert Winter Festival, Wes Stubbs is back where he started. Stubbs, a former winter festival board member for 17 years, was unveiled as the 2017 festival’s honourary chair on Thursday in recognition of his past service. For the long-time Prince Albert resident, getting the call was an exciting moment. Stubbs first started with the winter festival in 1967, two years after the event began. He continued his involvement into the 1980s, although in a reduced role after he became Prince Albert’s police chief. On Monday, Stubbs fondly remembered some of the shows he helped organize. He said that although today’s festival isn’t as big an event as it used to be, the current organizers are doing a great job revitalizing it. “We had a lot of good indoor events. Even the old-time fiddling used to attract a lot of people. We don’t get quite so many now, but it’s still something that we can revitalize,” he said.